and enlighten you to the things they find important when choosing a painter. 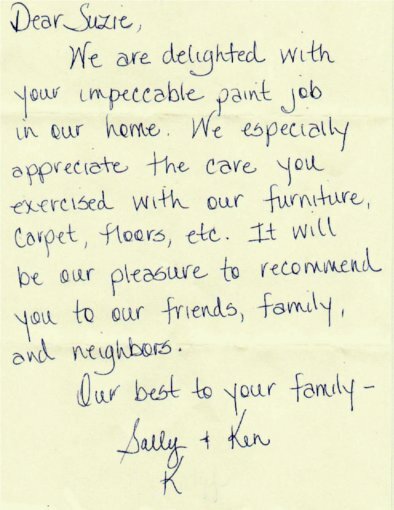 "Dear Suzie, We are delighted with your impeccable paint job in our home. We especially appreciate the care you exercised with our furniture, carpet, floors, etc. It will be our pleasure to recommend you to our friends, family and neighbors. Our best to your family." "We wanted to thank you both for the wonderful work in our room. We were especially pleased with your neatness and conscientious details . We will always be glad to recommend your work to the highest degree! " ~ Mike & Mary Anne D.
"We appreciate all that you did for us on our ceiling. Thanks again for going above & beyond." "So very pleased with your painting of our front door. Your attention to detail around the hardware, side lites and stained trim is exceptional- not a speck of paint anywhere it shouldn't be!!. You take pride in your work and it shows. You're on the top of my list for future painting projects and would highly recommend you!" "Suzie, thanks for a job well done. I am very pleased with all the painting that you have done!" "Once again, thank you so much for another great project. You guys are awesome! Our best compliment to you is not just another adjective, but simply... we're so glad to have found you!" ~Mike & Mary Anne D.
"Hi Suzie! The painting looks great, Thanks! I'll call you again for my next painting job." "Thank you, Suzie, for our beautiful sun room! It is better & prettier than I ever could have imagined it could be. You do wonderful work & we appreciate it. My first experience with SUZIE PAINTS came in 1998. My husband and I had recently purchased a house that needed painting so I checked the local phone book and discovered SUZIE PAINTS. I was impressed that the company was BBB endorsed and woman-owned. Suzie and her Team were reasonable, quick and efficient, and did an excellent job! My next experience with SUZIE PAINTS came more than a decade later - April 2012. My husband and I decided to finish our basement; as well as re-carpet and re-paint the rest of our 1500 sq. ft. ranch-style house. We hired a General Contractor for the basement and to coordinated the upstairs remodeling as well. We thought of using SUZIE PAINTS for the upstairs re-painting but it was easier to let the General Contractor coordinate it at the same time as the basement, so we let him use his subcontractor. Well, needless to say the painting company hired by the General Contractor did a horrible job! They were messy and disrespectful of our house and the quality of workmanship was beyond substandard - unpainted, thin, and streaked spots all over the walls. They did not “cut in” along the ceiling or baseboard trim. We were appalled! At this time, I made the decision to fire the painting subcontractor (with the support of our General Contractor I might add!) and get a bid to repaint the whole house. I knew who I could call – SUZIE PAINTS! I figured she did an excellent job the last time, she’s got to be even better now after all these years! I was not disappointed! Suzie and her Team came to my house at the scheduled time and provided a reasonable bid within a day or so that would address/fix all the issues left behind by the ex-painting subcontractor. Suzie did this and MORE! I cannot sing the praises of SUZIE PAINTS enough! Suzie and her Team were very professional, extremely talented, and respectful the whole time they were in my house. They addressed/fixed all the issues left behind (including fixing a settling crack that the other painting company just painted over! ), made creative suggestions (we accented a wall and a pole in a contrasting color that added a “pop” to the room), and finished on time. I learned a valuable lesson, if I need a painter who will go the extra mile, do an awesome job, and provide a service that outshines the competition, I’ll call SUZIE PAINTS! 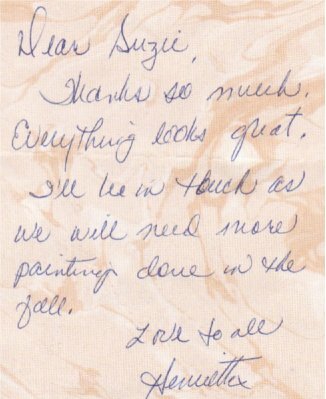 "Dear Suzie, I wanted you to know how great Merle & I think your painting is & how it improved our home's appearance. You are neat & kept the house clean & neat during the week you were here. You do a fantastic job of painting. You were on time & everything looks wonderful! If you ever need a reference, have your clients call us!" 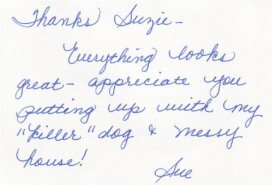 "Thanks Suzie, Everything looks great- appreciate you putting up with my 'killer' dog & messy house!" "Dear Suzie, Thanks so much. Everything looks great. I'll be in touch as we will need more painting done in the fall. Love to all!" ©August 2010-2015. Suzie Enterprises. All images, text and sub-pages unless otherwise noted.